Keywords: Solanum pubescens, ethnomedicinal, extracts, antibacterial, spectroscopic. The present movement to find out alternative antibacterial drugs from medicinal plants and the presence bioactive phytochemicals in fruit andstem bark of Solanum pubescens, promoted the authors to take up the antibacterial evaluation of fruit and stem bark extracts of Solanumpubescens. Against clinical and plant pathogenic bacterial strains by employing the methods of National Committee for Clinical LaboratoryStandards (NCCLS). It was observed that all the extracts showed inhibition zone against one or more of the tested bacteria between 80 to 160 μg/ml concentrationswith 3.17 ±0.17 to 10 ± 0.17 mm inhibition. The spectroscopic determination of MIC and MBC exhibited by extracts went between 100-300μg/ml. In fruit extracts, fruit chloroform (FC) has inhibited all the tested organisms, similarly, fruit ethyl acetate (FEA) inhibited Bacillussubtilis and Xanthomonas sp. whereas, fruit ethanol (FET) has been restricted to inhibit Bacillus subtilis at 100 μg/ml. Furthermore, amongall the active extracts of stem bark extracts bark chloroform (BC) showed potential inhibition of Bacillus subtilis and Escherichia coli with81.44% and 82.17% respectively. Similarly, bark bottom crystals (BBC) extracts inhibited Bacillus cereus and Xanthomonas sp. 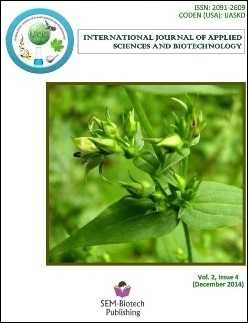 with 77.38%and 77.72% respective inhibition at 100 μg/ml concentration.The present exploration has revealed that the extracts from fruit and stem bark of S. pubescens revealed potential antibacterial activity againstGram (+) and Gram (-) bacteria, which are validating the ethnomedicinal claims and this the first report of investigation of above extracts forits antibacterial activity.